Are you interested in building a freelancing network across the globe! Build a pool diverse freelancer where the technical experts meet at one point by recruiting projects from various employersand specialized freelancer. In the freelancing market, there are several freelancing websites available and our objective to overcome the struggles tostart a website and compete with other competitors to withstand a long-term freelancing business in the industry. As per the survey, it reveals 43 percent of people prefer freelancer jobs out of 100, since mobs do not rely on routine day to day works. Our vWorker Clone Script has multi-compatible businessfeatures, in that there were three views such as Employer view, Freelancer view,and Admin view. Since our Stepstone Scriptis well developed with open source core PHP platform and thus supports numerous freelancing concepts. Let us dive in deep to insights of Employer dashboard of Hubstaff Talent Clone Script, the user can browse the list of categories and post project on the desired subject. Also, search project through filter feature, can set fixed project or hourly projects, get contact details, company info, monthly payouts etc. Users allowed to Project id, project description, job details, about the employer, ratings, additional files, and skill required for the project. In our Hubstaff Talent Script On posting the project which supports bidding expiry mention as well as file upload functionality. Although the user can see the project name, bids, skill, date of the post, price, expiry status etc. As a freelancer view,the user can find the projects easily through search category by location, country or by skills he/she desired. With filter, option user are eligible to know the status of projects like open, in progress and closed status. Our vWorker Script can manage employer invoice, pending or approved, invoice status like unpaid, paid, withdrawn or rejected. Can communicate with the employer they can send, receive, draft, and archive messages. In our Stepstone Clone Script,one can set portfolio and overview profile of the user to showcase the skills. A powerful CMS page to describe the website activities like about us, testimonials, employers, services, social network integrations etc. As an admin can have entire website control like site management, CMS management, location management, category view, managing skills, user controls, project supervision, bidding set, project promotion, newsletter contribution, budget and inquiry management and more. Truelancer Clone Script is designed and developed to be SEO friendly structure in accordance to Google standards.Also, our Truelancer Script supports security algorithm to safeguard from the malware attacker. 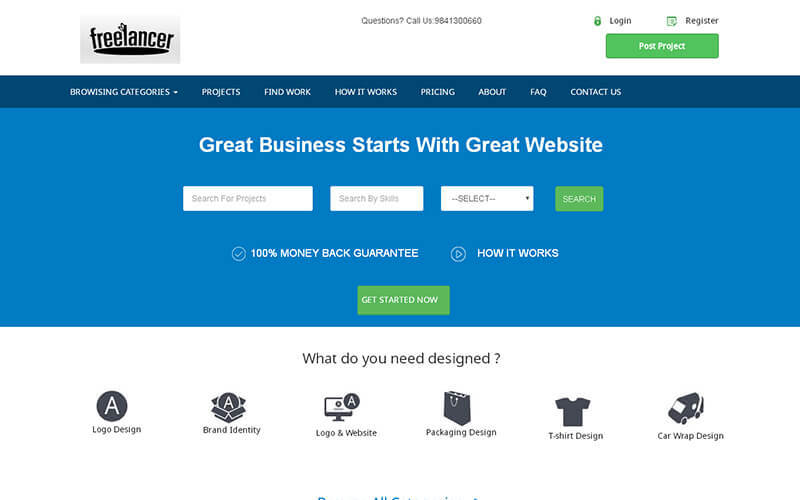 With one-year technical support and source code update upon purchasing the freelancer website. Admin dashboard was pretty clear to navigate into the website, I like this freelancer clone script.